> Iron Mountain > IDC Topline Report: Are your PCs and Laptops Recovery and Discovery Ready? 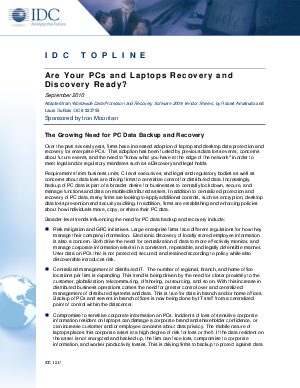 IDC Topline Report: Are your PCs and Laptops Recovery and Discovery Ready? Increasingly firms are adopting data protection and recovery for enterprise laptops and desktops. The adoption of this technology is fueled by previous data loss events, concerns about future events, and the need to "know what you have at the edge of the network" in order to meet legal and/or regulatory mandates such as eDiscovery and legal holds. Read this new analyst report to learn more.